Leucojum aestivum was named the county flower of Berkshire following a 2002 survey by the wild flower and plant conservation charity Plantlife. 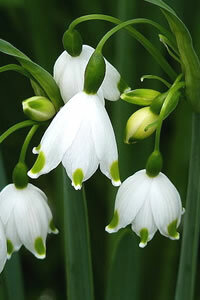 It was once common in the Loddon Valley, hence its alternative name of the 'Loddon Lily' . For maximum freshness, please keep seed refrigerated in its original packaging until it is time to plant. Sow seed in containers in a cold frame in fall. Grow in reliably moist but well-drained, humus-rich soil in bright light, but not direct sun.